The master bedroom at Flip 6 was anything but a retreat. It was gross with decaying carpet, stained walls, and beat up doors. It needed some freshening up to make it feel like a space someone could relax in after a long day. I didn’t get a picture of the gross carpet before we removed it. It was probably the most disgusting I’ve seen in a house– and I’ve seen a lot of dirty carpets. The existing trim was beat-up stained brown, but we gave it a fresh coat of white. Again, the work started before I could snap a pic! I found some stock carpet that was pretty affordable. 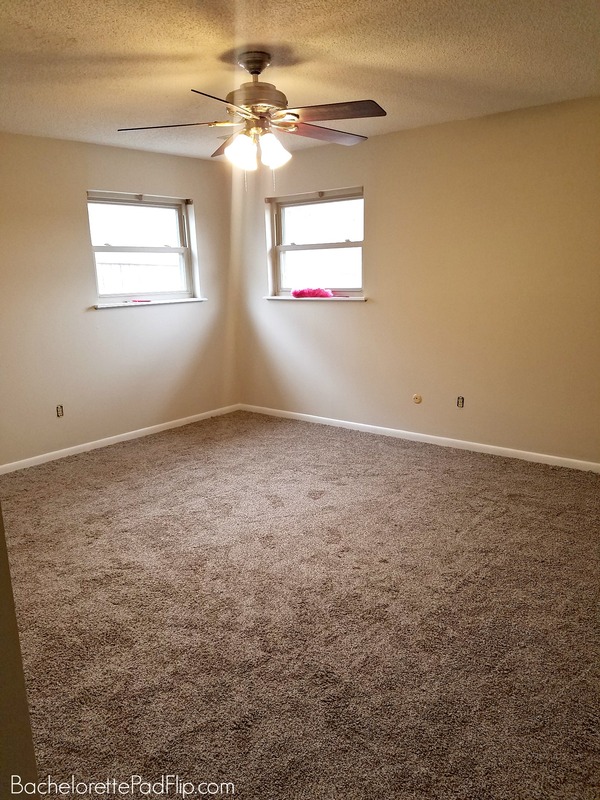 I know that carpets are hit and miss with buyers, but the rest of the house is different types of wood floors (and wood look tile). I didn’t want to compete with those textures, so I thought carpet softened the room. 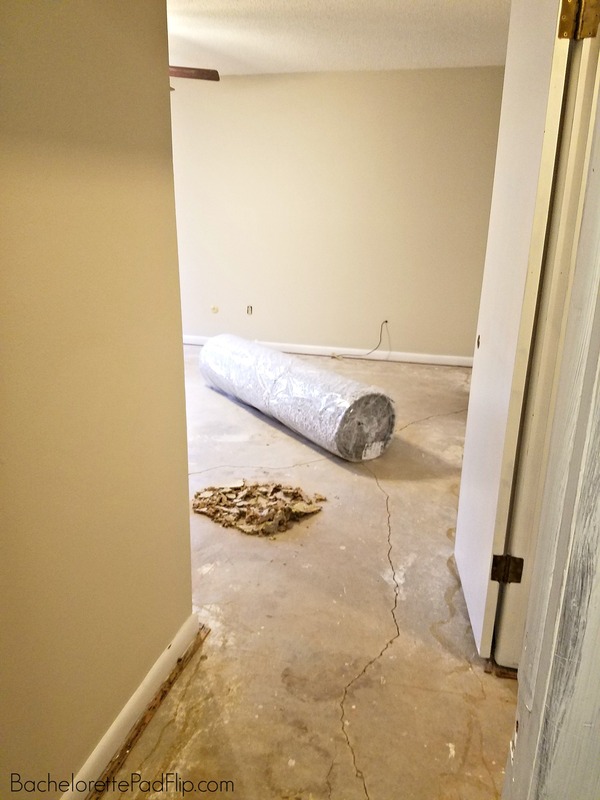 When having carpet installed in just one room, it’s really affordable! 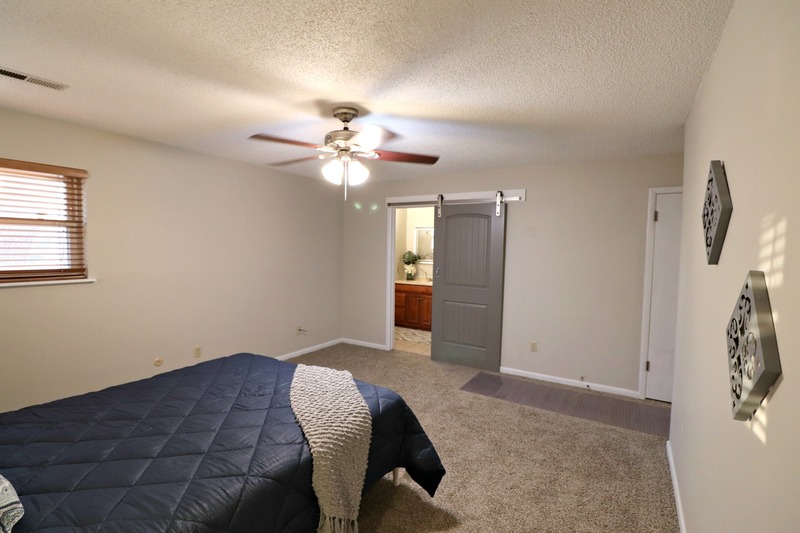 I don’t think staging has to be fussy, elaborate, or expensive. The point of staging is so that buyers can see the potential and purpose in a room. Keeping with a neutral palette, I accented with warm grays and navy. The original doors were hollow brown (with fist holes). 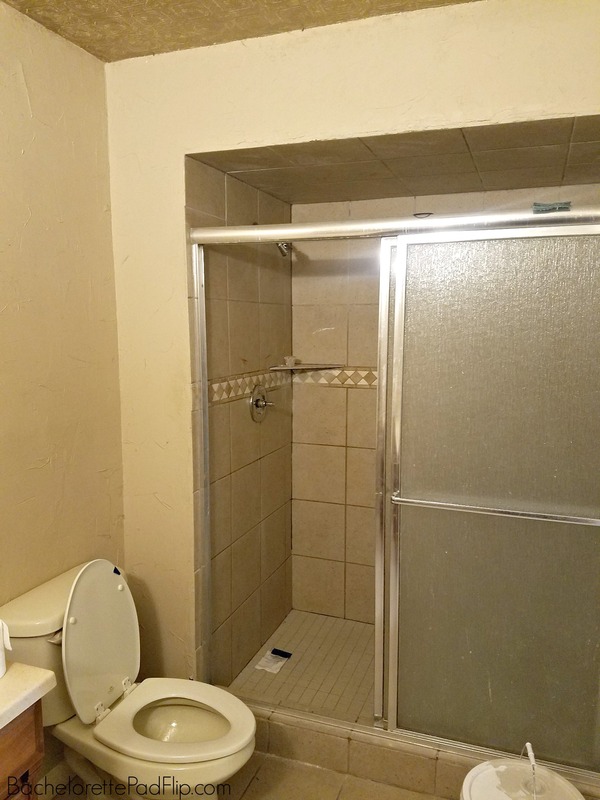 Some, like the closet, were salvageable, but the bathroom door was beyond help. Plus, I always like to add a barn door. They add value, they’re appealing to buyers, and increase sellability. So I purchased a $30 interior door from Lowe’s and had it painted the same color as the kitchen cabinets. 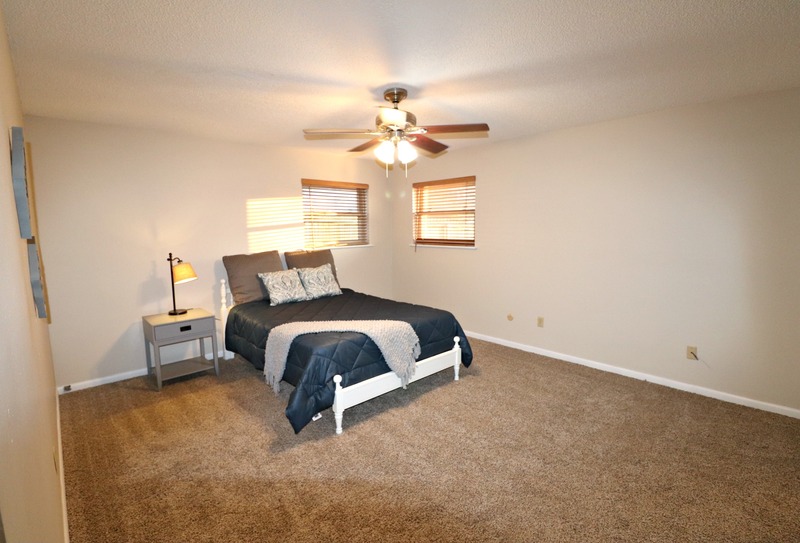 The bedroom isn’t a jaw-dropping transformation. My goal was primarily clean up and brighten. 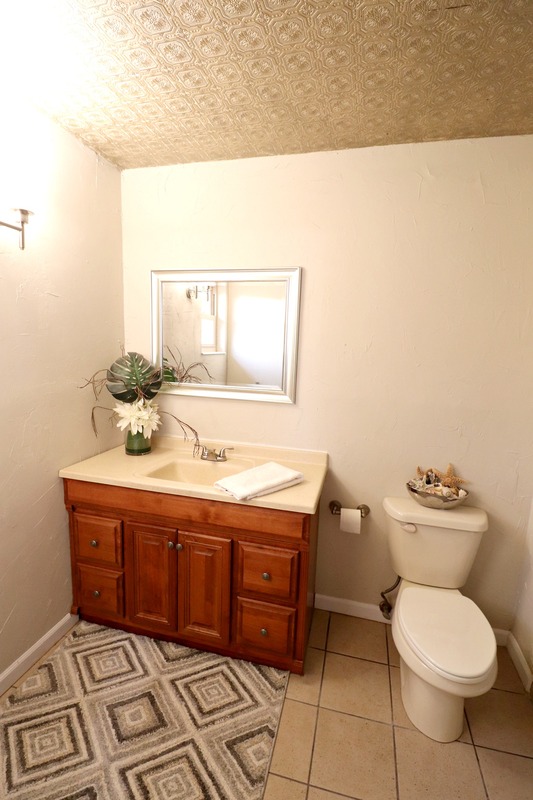 The master bathroom had good bones…even without a mirror. I’m not sure what happened to the mirror, but it was nowhere to be found! The cabinet and countertop were actually in really good condition and didn’t appear old. They had also updated the trim at some point, so I opted to keep that. The texture on the walls was awful, but it would’ve been so costly to retexture it. Sometimes you just have to work with what you have! The existing shower was filthy but solid. 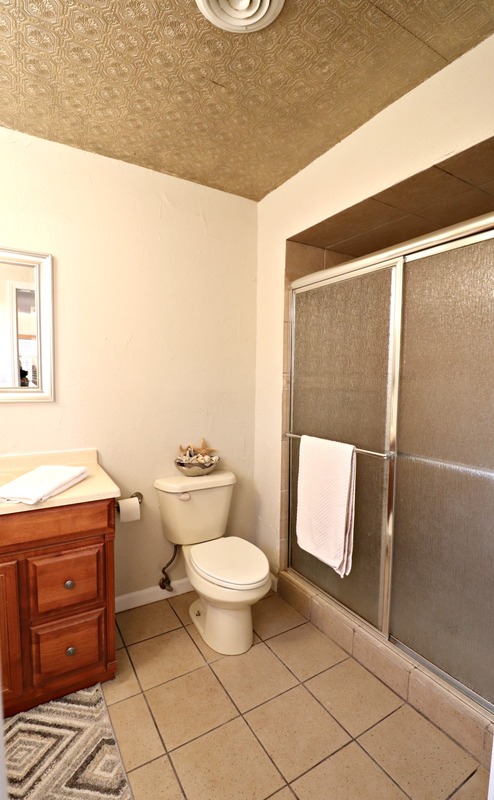 My main issue with the master bathroom was that there was so much beige. I wanted to slightly break up the beige. I didn’t really change much in this room, so I relied on staging to bring in a brighter design. 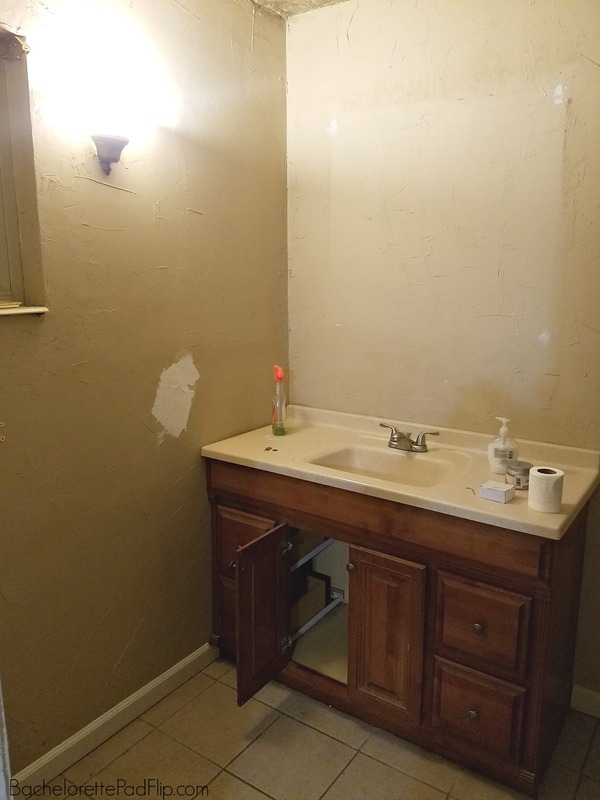 The bathroom is the same vanity, same tile, same toilet, same shower. The difference? I added a fresh coat of Edgecomb Gray paint. I used lush, soft linens and rugs to soften up all the tile, and a thrift store mirror to mimic the shower door frame. Transformations don’t always have to be extreme to be effective. I added a new faucet since the existing one was no longer fully functioning, and the only other things I added to the space was the mirror I scored for $12 at a thrift store and a $12 light from Amazon. The light isn’t $12 now…but I used rewards from my credit card to get it for $12. I use this card (affiliate link) to regularly get cash back up to 5%. I think, in total, I spent around $40ish dollars on this room. New faucet, thrifted mirror, discounted light, and fresh paint- it works wonders! Nice design choices! Just a thought for next time. One other thing you could do on a penny is change the color of the floor grout. We did that in a bathroom where the tile was still good but we wanted to brighten up the room. 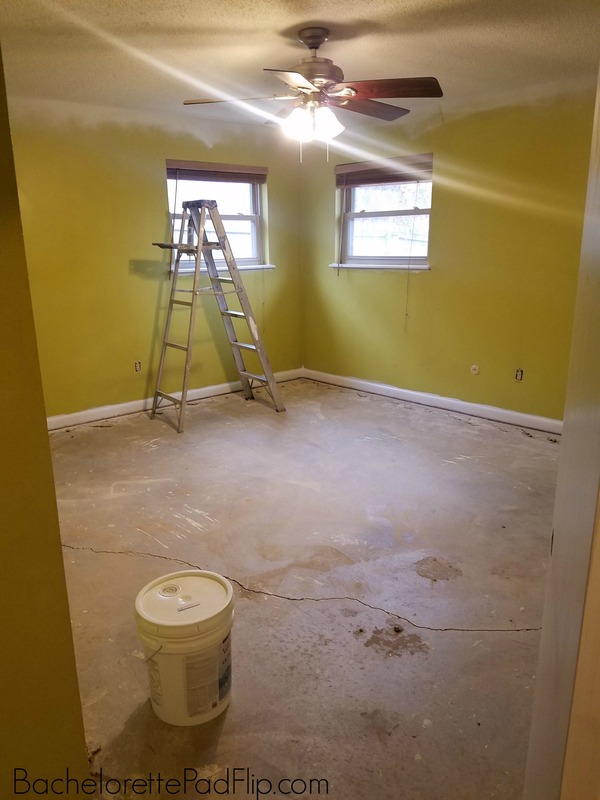 We went from a dirty beige to a medium grey, and it made such a difference for little investment! I LOVE to paint. Everything looks fresh and clean. Nice choices. Would you replace blinds if they were bad or out of date? What are your thoughts on glass showers/ shower doors? I enjoy watching these transformations. We are hoping to do some sort of real estate investing when we are done with the army. Mary, I’m just now seeing this comment! Sorry! I rarely replace blinds and almost always rip them out unless they’re nice wood blinds. Unless they’re nicer blinds, they don’t add value. I like glass shower doors and recently installed a frameless one at Flip 6!